Rhubarb; a Crumble or Pudding? Apropos pudding, cake, and now crumble, the debate still rages around the world from Gibraltar to NY city, Mexico to Sydney what the differences are. It is now generally conceded, even acknowledged, that one is steamed or boiled while the other is baked. A Christmas pudding is steamed or boiled in a cloth like other puddings. What about Yorkshire pudding? (steamed in a cloth 😉 ) There is black pudding in a net or cloth, and in the case of G getting an invitation years ago in Whitby to go ‘out for pudding’ this meant a cup of tea with a muffin in a sea-side Tea establishment. Kippers at Whitby was something totally different, it was neither. For a Europhile it remains all a bit like cricket, very esoteric. The stalks of the rhubarb in our garden are still green. Helvi reckons not all rhubarb turns red. Last year it was green too. I then made a delicious crumble with apple, some muesli and lots of butter. The apples were the green ones, very tart but snappily juicy. The addition of cinnamon and a couple of cloves did add some spice although H reckoned the cloves were a bit over the top. 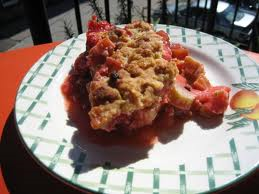 Anyway, the word crumble must indicate the looseness of it all. It crumbles. I am sure no-one could call it a pudding or cake. I have seen it being called a pie. I don’t know. I suppose there are meat pies, apple pies, pumpkin pies, mince pies, why not rhubarb pie? Yes, I googled rhubarb and the stalks can be green, green fading into pink or bright red. It is a fact of varieties and not of age or soil. Anyway, all stalks turn green when cooked. What a revelation! I am struggling trying to make this tale amusing but I am not sure if rhubarb lends itself to humour as in lost socks or the profoundness of Pierre Cardin’s lost pyjamas, the pathos of a little boy’s lost train ticket. Last night we had dinner at the local Royal Hotel. My favourite was on the blackboard ‘fresh pepper calamari’ with H’s choice being the ‘flat-head fish fillets and stringy chips’. A bottle of fine white ‘The Royal Chenin blanc’ in an ice bucket made it to our table as well. It will take the world by storm. Phew…I made it! The ‘Body Corporate AGM meeting with imposing Table. If your life ever gets to a point where you need to take a break from neck breaking activity, intellectual (pouring over nothingness) or otherwise (pouring concrete), consider going to meetings, especially official meetings. We went to one yesterday, and I have never felt more ready for action than afterwards, any action. As we entered the meeting room some people were seated already. There was a nod and a formal murmur of ‘morn’ from people that we see almost daily. Do AGM meetings make people change into frozen officious beings, trapped into a pre-destined kind of ‘meeting type?’ The metamorphosis from ‘normal being’ to ‘meeting being’ happens as soon as one is within the range of a large oversized table with the ‘minutes of the last meeting’ distributed out for all the members to ruminate over. The table is so large and intimidating that all seated around it immediately appear much smaller than usual. The sensible thing to do would be to appear incognito. I wondered what the reactions would be appearing in my Batman Outfit, mask and all. A hushed silence followed with a move away from my chair? Would procedures cheer up a bit? 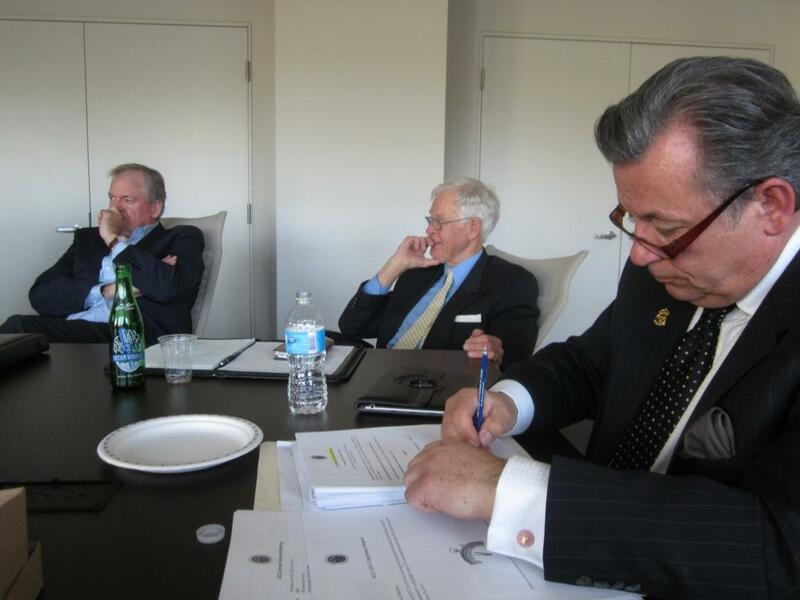 I cannot fathom the rigidity of the ridiculous format that AGM’s or any meetings really seem to adopt. No wonder they don’t work. There is never an excuse for doing things the most stifling, the most mind bogglingly boring way. Do they hold meetings like that in Cuba or Bali, Mexico? Item 1 on the agenda is the report on Fire Hazards and archive fees. Ah great, really, really great stuff, can’t wait for Item 2. May I ask you for a dance? Shall we visit the local morgue, a bit of tap-dancing, feed the ducks? No; Item 3 now. Anyone thought of passing Miscellaneous Expenses?